So after doing my first #LittleLoves post two weeks ago, I then forgot to link up last week! Not a great start! I love reading about what other people are loving right now and always feel inspired after reading everyone's posts. I'm not massively into reading books. I get into bed and after a long day, I want to close my eyes and sleep, not sit up reading a book. I do, however, love nothing more than sitting down with my iPad or laptop in the evenings, mug of hot chocolate in hand, and have a good read of some of my favourite blogs. This past week, I have been loving reading about Katie's family adventure to Lanzarote. Her photos and videos are utterly gorgeous but warning, it will make you want to go and book a holiday! After reading Morgana's post last week, I thought I'd have a little read of a blog post she recommended by the lovely Emma. As a relatively new blogger who is also quite shy, I really related to this post. As I have been decorating and gardening most of the past week, I haven't really been wearing anything exciting other than joggers and a hoodie, but I have switched up a few make up products recently and have been loving these. I wear foundation every day and had been using L'Oreal's True Match foundation, but the colour was too pale, it made me look washed out and exhausted and about 10 years older than I actually am (so annoying when you spend so much money on these things!) So I decided to go back to my trusty Bourgois Healthy Mix Foundation in a more flattering shade. As Bourgois is currently on 3 for 2 in Boots, I also thought I'd try out their Healthy Mix Concealer which is lovely and thick, but blendable, and Colorband 2 in 1 Eyeshadow Stick. I have also been loving my False Lash Superstar mascara by L'Oreal. Again, mascara is something I wear every single day, and I like to have one which is good but not too expensive as I get through it so quickly. This one gives me long, voluminous lashes and it doesn't go clumpy. I don't get much chance to listen to the radio unless I'm in the car, but this week I heard this song by Ellie Goulding again, and really enjoyed it. When Little One and I do baking, it can either go incredbly badly wrong or amazingly well. When we find a recipe which just works and gives Little One enough jobs to do within his grasp at 22 months, we will make them again and again. One such recipe is this one. Banana, honey oat muffins. They're healthy, really tasty and easy to make with a toddler. They're great for breakfast on the go or as a little pick me up snack in the afternoon. 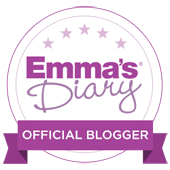 ...And finally, I have started to have a little bit of a much overdue blog makeover this week. I have made a couple of changes to my blog header and the page tabs across the top. It's all been a bit of a computing headache as HTML is not one of my areas of expertise, but I was determined to give it a go! All thanks to this fabulous post I found here. However, after much fretting I have finally got it how I want it and I really do love it!